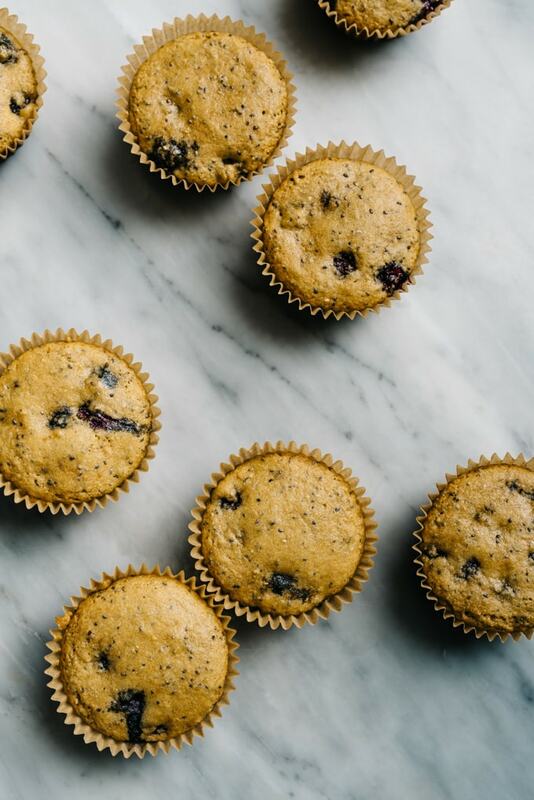 These paleo blueberry muffins are simply perfect. 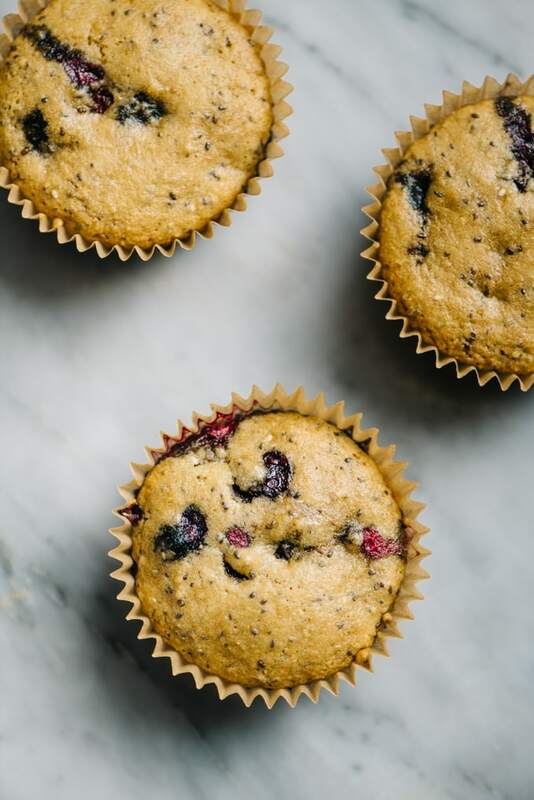 Sweetened with maple syrup and studded with nutritious chia seeds, these nutty, jammy, crumbly muffins are an easy and filling breakfast or snack that kids and adults alike will gobble up! I’ve been working on the perfect base for paleo muffins for what seems like freaking forever. Eight batches later, and these guys surged ahead as the clear winner. I’m telling ya, they are THE BEST paleo blueberry muffins I’ve ever had, and I’ve had…well, a lot. These guys are moist and tender, with a nice crumb and golden top – just like a tasty muffin should be. They’re sweet, but not cloying, with a jammy blueberry and nutty flavor. And they’re surprisingly filling thanks to a combo of healthy fats and fiber from chia seeds and olive oil. Screeeech….what was that? Chia seeds? In a muffin? You might be used to seeing chia used as an egg substitute in vegan baking, or to thicken up a batch of overnight oats or paleo pudding. But they’re also seriously awesome tossed whole into muffins and quick breads. They don’t need to be ground, like flaxseed, and their texture is almost like poppy seeds, but awesomer. Awesomer because of all the healthy stuff like calcium, antioxidants, omega-3 fatty acids, and fiber. Chia – do it! My picky eater children gobbled up these healthy nuggets like they were last blueberry muffins on earth, and with crumbs falling out of their tiny mouths asked “Can you make more”? If that isn’t a winning paleo muffin, I don’t know what is. 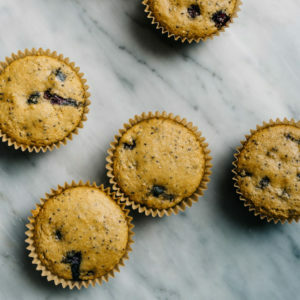 Made with a base of almond flour and chia seeds, naturally sweetened with maple syrup, and moistened up with extra virgin olive oil and eggs, these healthy paleo blueberry muffins are simply perfect. They’re an easy and filling breakfast, snack, or packed lunch addition. 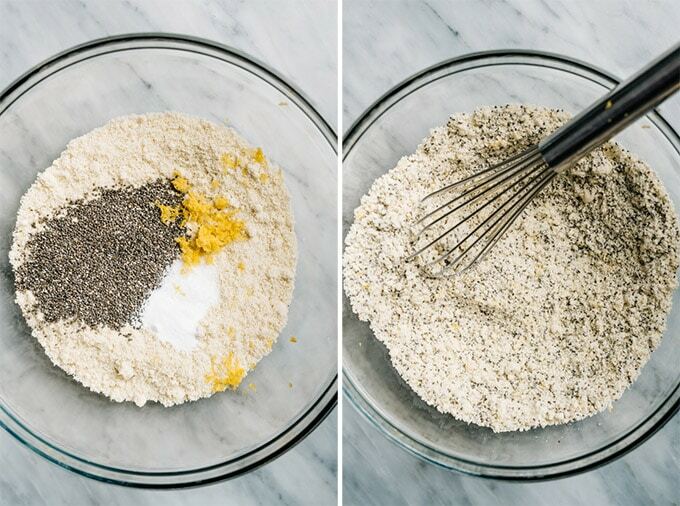 Mix your dry ingredients – almond flour, chia seeds, lemon zest, baking soda, and salt. Whisk ’em up until everything is pretty well distributed. Mix your wet ingredients. First, whisk the eggs until they’re super frothy – about a minute should get the job done. Whisking the eggs creates air, and gives these muffins their light and tender texture. Then add the remaining wet ingredients – maple syrup, olive oil or refined coconut oil, lemon juice, and vanilla extract. Lemon juice is acidic, and it reacts with the baking soda to give the muffins additional rise. Lemon is also flavor BBF’s with blueberries, hence the zest in the dry ingredients. Pour the wet ingredients into the dry ingredients and fold until just barely combined. You added a whole bunch of air when you whisked the eggs, so don’t risk deflating them too much by over-mixing the batter. Last, fold the blueberries into the batter with a rubber spatula. Line a muffin tin with parchment liners, then scoop the batter into the liners. A standard sized ice cream scooper is the perfect portion for 12 muffins. Bake the muffins at 350°F for 20-25 minutes. The exact time will depend on how accurate your oven is, so check them at 20 minutes. The muffins are done when the tops are golden brown and spring back lightly when pressed with the tips of your fingers. Most paleo muffin recipes call for refined or virgin coconut oil as the fat of choice. It’s a natural substitute for butter in paleo baking, lending that moist and tender texture to the finished product. Refined coconut oil is odorless, tasteless and more highly processed, while virgin coconut oil has that classic coconut flavor and aroma, and is less highly processed. While I love coconut oil and use it often, my go-to fat for paleo baking is extra virgin olive oil. It reacts in the same way as coconut oil, and can be substituted in a 1:1 ratio. It’s also more economical, and offers the same health benefits as virgin coconut oil, both being chock full of vitamins and healthy fats. But what I really love is the rich, buttery flavor that extra virgin olive oil brings to paleo baked goods. 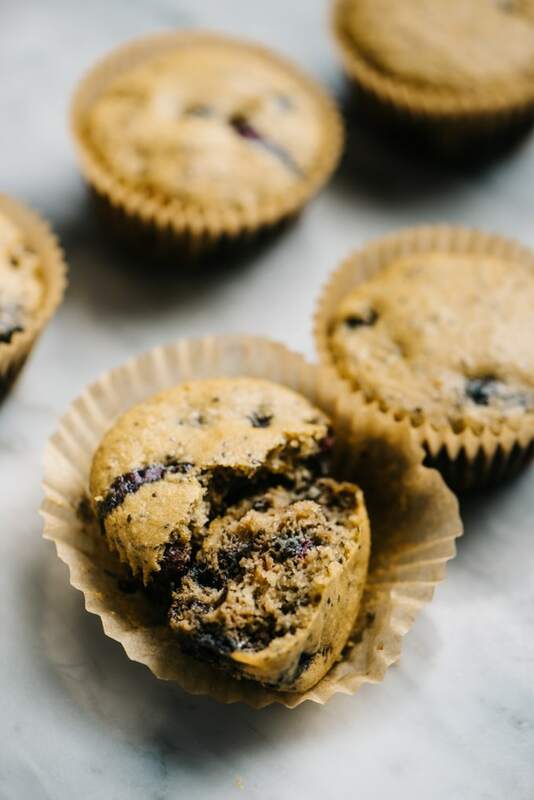 There are certain recipes where that subtle hint of coconut flavor is perfect – these paleo blueberry muffins isn’t one of them though! How do I store paleo muffins? These muffins kept well at room temperature for several days. I stored them on a plate covered with a loose tea towel. They should stay fresh for up to 48 hours stored this way. 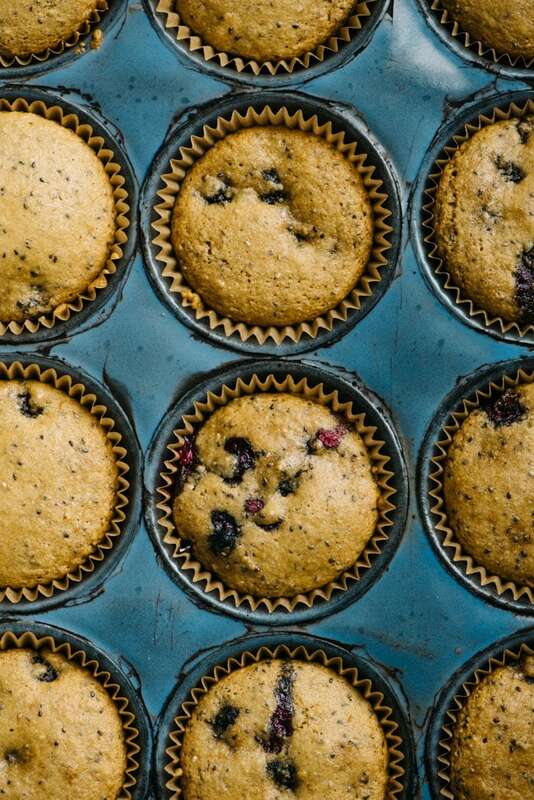 To extend their shelf life, refrigerate the muffins in the fridge for up to a week, or freeze for up to three months. How do I measure almond flour? Almond flour can be difficult to measure accurately – it tends to clump, and it’s easy to overpack your measuring cup. For these reasons, I highly recommend using a digital scale. One cup of almond flour weights 92 grams. I’ve had this digital scale for almost four years, and it’s a total workhorse. Plus it’s cheap! If you don’t have a digital scale, measure the almond flour as you would normal flour – stir the flour to loosen it up, scoop the flour into your measuring cup with a spoon, then level off using a knife. Can I use frozen blueberries? Yes! Don’t defrost them first. To prevent them from leaching too much color into the batter, reserve one tablespoon of almond flour from the dry ingredients. 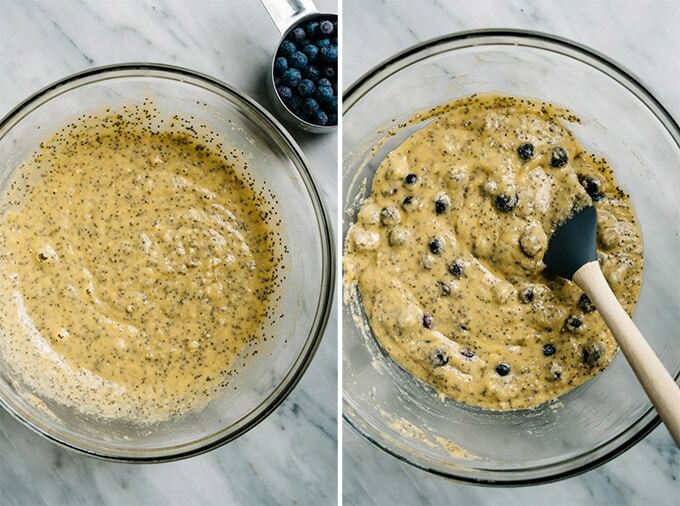 Toss the frozen blueberries with the almond flour before adding them to the batter. Can I use honey instead of maple syrup? Yes. Honey is stronger in flavor, but not necessarily sweeter, and can be substituted 1:1 for the maple syrup. 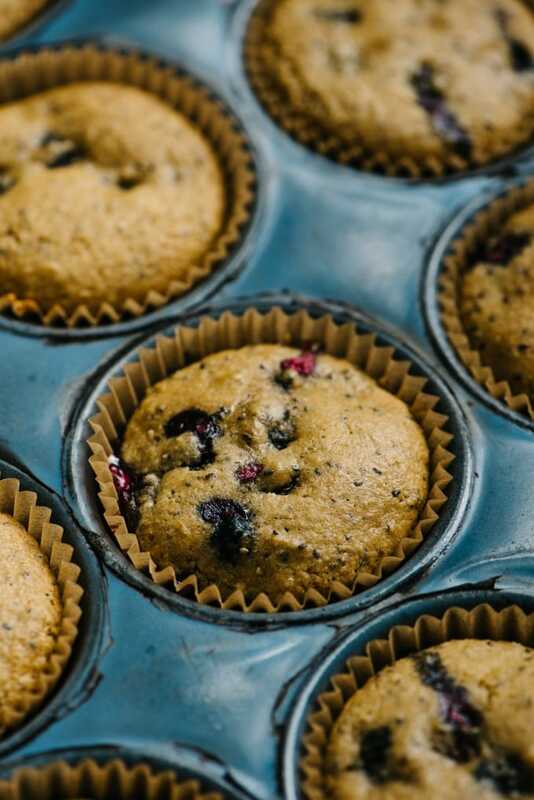 What are the best liners for paleo muffins? I use these parchment-like liners from the brand If You Care. Nothing has ever stuck to them (even egg muffins!) – I love them! I buy them in bulk from Amazon because they’re cheaper, but I can also find them at my local coop, Whole Foods, and even my local grocery store just started carrying them. You can also use true parchment liners for the same non-stick experience. 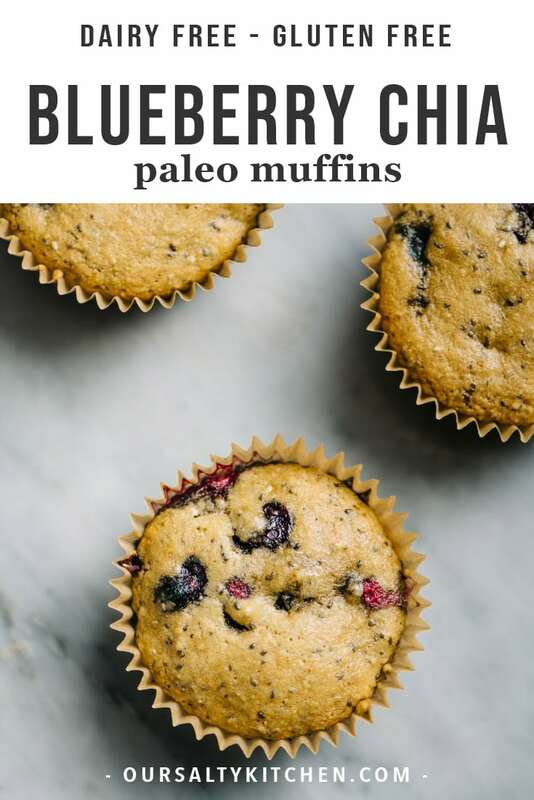 Are these paleo muffins low carb? They’re borderline, at 7g net carbs per muffin. Almond flour is higher in carbs than say coconut flour, and maple syrup definitely adds a healthy dose. Where do you buy paleo baking ingredients? Amazon baby! Amazon offers the best bulk pricing for my favorite paleo baking ingredients, including Bob’s Red Mill Super-Fine Almond Flour, Chia Seeds, and Extra Virgin Olive Oil. I also get my parchment liners from there as noted above. 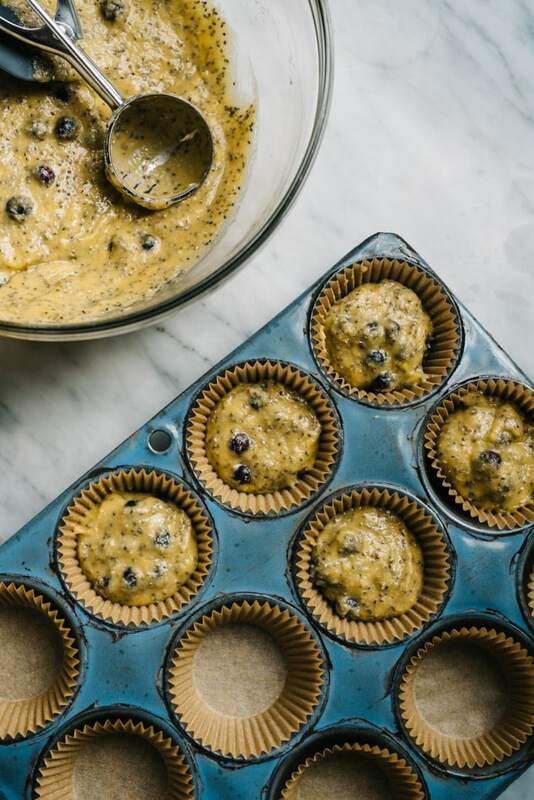 Made with a base of almond flour and chia seeds, naturally sweetened with maple syrup, and moistened up with extra virgin olive oil and eggs, these healthy paleo blueberry muffins are simply perfect. They're an easy and filling breakfast, snack, or packed lunch addition. Heat the oven to 350°F. Place 12 parchment liners into a muffin pan. 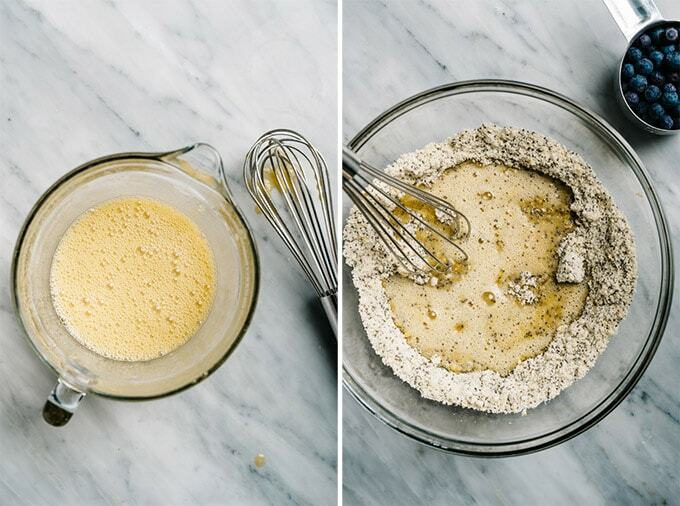 Whisk together the almond flour, chia seeds, lemon zest, baking soda, and salt. In separate bowl, whisk the eggs vigorously until foamy. Add the lemon juice, maple syrup, olive oil or coconut oil, and vanilla and whisk until incorporated. Pour the wet ingredients into the dry ingredients and fold until combined. Do not over mix. Add the blueberries, and fold until combined. Divide the batter between the muffins cups (a standard sized ice cream scoop is the perfect measurement!). Bake 25 minutes, plus or minus 2-3 minutes depending on your oven, or until the tops are golden brown and spring back when gently pressed with your fingertips. Remove from the oven, cool in the tin for 5 minutes, then remove from the tins and cool on a rack.